WASHINGTON (AP) Great white sharks have some things in common with human serial killers, a new study says: They don't attack at random, but stalk specific victims, lurking out of sight. The sharks hang back and observe from a not-too-close, not-too-far base, hunt strategically, and learn from previous attempts, according to a study being published online Monday in the Journal of Zoology. Researchers used a serial killer profiling method to figure out just how the fearsome ocean predator hunts, something that's been hard to observe beneath the surface. "There's some strategy going on," said study co-author Neil Hammerschlag, a shark researcher at the University of Miami who observed 340 great white shark attacks on seals off an island in South Africa. "It's more than sharks lurking at the water waiting to go after them." The sharks had a distinct mode of operation. They were focused. They stalked from a usual base of operations, 100 yards (90 meters) from their victims. It was close enough to see their prey, but not close enough to be seen and scare off their victims. They attacked when the lights were low. They liked their victims young and alone. They tried to attack when no other sharks were around to compete. They learned from previous kills. 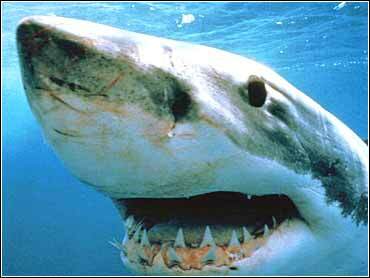 There's a big difference between great white sharks and serial killers and it comes down to motive. The great whites attack to eat and survive, not for thrills. And great whites are majestic creatures that should be saved, Hammerschlag said. "They both have the same objective, which is to find a target or prey or victim," said study co-author D. Kim Rossmo, a professor of criminal justice at Texas State University-San Marcos. "They have to lurk. They want to be efficient in their search." R. Aidan Martin, a Canadian shark researcher who has since died, was reading a mystery that detailed the relatively new field of geographic profiling, which tries to find criminals by looking for patterns in where they strike. He connected with Rossmo, a pioneer in that criminal field, and they applied the work of tracking down criminals to sleuthing shark strategy. Martin and Hammerschlag watched sharks from sunrise to sunset, applied the "fancy math" of geographic profiling and came out with plots that showed there was some real stalking going on, Hammerschlag said. Older sharks did better and were more stealthy than younger, smaller sharks, demonstrating that learning was occurring, he said. The study focused on just one location, but the same principles are likely to be applied to other shark hunting grounds. They can't really apply to shark attacks on people because those are so infrequent, Hammerschlag said. But if you could figure out the base of operations for the great whites, it would give you a good idea of places to avoid if you were worried about shark attacks, he said. University of Florida shark attack researcher George Burgess, who had no role in the study, said the researchers simply used a new tool to show what scientists pretty much knew all ready: "Sharks are like many other predators that have developed patterns to their attacking that are obviously beneficial as a species."